Data is becoming more and more abundant as everything moves online, and we are all collecting our fair share of business data. The key is understanding your data. If you know what data you have, and you understand what that data means, then you are on the front foot when it comes to making business decisions. This is vital when running a successful business. The data which you have collected, can often be exported as a CSV file, which is similar to an Excel file, but not quite the same. The problem is that the data is often just dumped into the CSV, and is usually not clear or comprehensible. If you have the data available, but don’t understand it, what is the point? There is none, that is why we came up with a solution. We create custom spreadsheets, which will accommodate you to copy your data, and paste it into the spreadsheet. The spreadsheet will then spring to life, generating bespoke reports, showing you exactly what that data means. Take a look at this case study of a simple spreadsheet that we use to analyse our website downloads. Imagine what we can do for you with your data. Although we can analyse just about any data from anywhere, there are a few types of data which we often get asked to analyse. Here are some of our main requests. Do you use any of these? Would you like a better understanding of your data? There are loads of CRM software packages which you can purchase. Now, many people still buy custom CRM solutions from us, made using Excel as they need a bespoke solution. If you want an off-the-shelf-software solution, then you may be limited to the reports which you can generate. Bespoke software will generate loads of data, but may not use all of it, or at least present it in a way that you need. If this is the case, then why not see what data you can export, which can then be analysed? Let us know what data you have available, and what you would like to know, and see what we can do for you. Many people think that we make bookkeeping solutions, which we can do, but we don’t get asked too often. Why not? Because most businesses opt to use an accounting package. We are all for accounting packages, and will usually recommend them over spreadsheets for bookkeeping, but they often fall short with the available reports. Do you need some report that your accounting package won’t do? No problem, export the data as a CSV file, get it over to us, and let us know what you would like it to tell you. E-Commerce websites are great, and they allow all sorts of transactions to happen, often without you even being involved. If you have an E-Commerce website, you may not get a feel for what is being sold, and what products are more popular. Often such sites are guilty of not producing comprehensive reports, and even when they do there is so much data available, that they can’t analyse everything. If you want to get a better understanding of your sales trends and activities, export your data to a CSV, and let’s talk about what you need to know. Analysing and reporting on your data is what we do best, and E-Commerce sites are known to create a bank of valuable data. We all use social media, but do we understand what we have done, what has worked, and what hasn’t? Probably not. Yes, most sights have analytics or insights of sorts, but they never use all the data in the reports. If you download your data as a CSV, we can create custom reports to show you what you need to know. In fact, we have a free range of social media analysis tools. Use these with our compliments, and if you need anything bespoke, please get in touch. Google are known for collecting data, and using it to make loads of money. It is hard to do any kind of business today and have nothing to do with Google. Whether you use Google Analytics, Search Console, or any other Google product, you probably have access to mountains of useful data. The other thing Google are known for is making their reports unnecessarily complicated. If you have Google accounts and access to loads of useful data, get in touch and we will help you better understand that data. We have two standard products when it comes to Google products, our Google Analytics report, and our Google Search Console report. If you need something more bespoke, we’d love to chat. If you use another analytics solution, and need that analysed, get hold of the CSV exports and get in touch. One of our largest clients, uses many spreadsheets to analyse all sorts of data, which gives him the edge in his industry. Not only this, but he is also able to see what his data means, which enables him to make the best decisions moving forward. This is the referral which he gave to Richard (the owner of Spreadsheet Solutions). We have been working with Richard on a number of initiatives in relation to retail management and overall business development. This relationship was born out of a companywide frustration of playing with API’s in which we regularly found inconsistencies in data. Richard has enabled us to create a methodical and accurate system for reporting in a number of key business areas including purchasing and accounting. The team have grown very fond of Richard for the simplicity he is able to breathe into a technical problem to allow us to solve the conundrum together. This along with his friendly manner and fast turn around times on projects means the team are coming up with more innovative spreadsheet solutions all the time! Please do not hesitate to contact us for a verbal reference. Now that you know that there is a solution for better understanding your data, we would love to create some custom solutions for you. Simply send us a copy of the CSV file which you would like to better understand, and tell us if there are any specific reports which you would like to see (or send us a copy of the desired report if you have one). 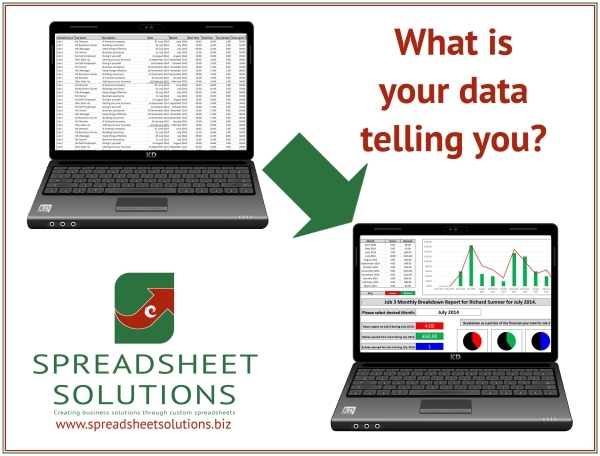 What’s more, if you’d like your data analysed but you don’t want to use the spreadsheet, we can do it for you. You simply send us your data, we send you the PDF report. Just let us know what you need. Complete these details, to get in touch to get some data analysed, otherwise take a look below for some further options. Please attach an example of the data which you wish to analyse. If you're concerned about privacy, you can change the details for now, but please don't change the format or layout. So for example, you can change a phone number to 07512345678 to hide the number, but leave the format as it was originally. Now, if you have an example of how you would like the report to look, please add it here. If you don't, that is not a problem. Sometimes people want us to match previously produced reports, so if you have such an example, add it here. Do you want us to analyse the data, or provide a spreadsheet so that you can do it yourself? If you'd like us to analyse the data for you, how often would you like this done (Leave blank if you want a spreadsheet made)? If you have any other notes or messages for us, feel free to add them here. We do get some spam through this contact form, so we have added a security measure below, please complete this to confirm that you are in fact human. Need some more information? Take a look at the links below to show some similar pages which you may be interested in. Take a look at this service which we supply if you don’t want to do it yourself. Download some free spreadsheets to analyse the exported CSV files from your favourite social media platform. This brochure shows how we use Excel to create spreadsheets to analyse CSV files. We have some free download, some of which analyse exported data, please use them with our compliments and see how they can help.